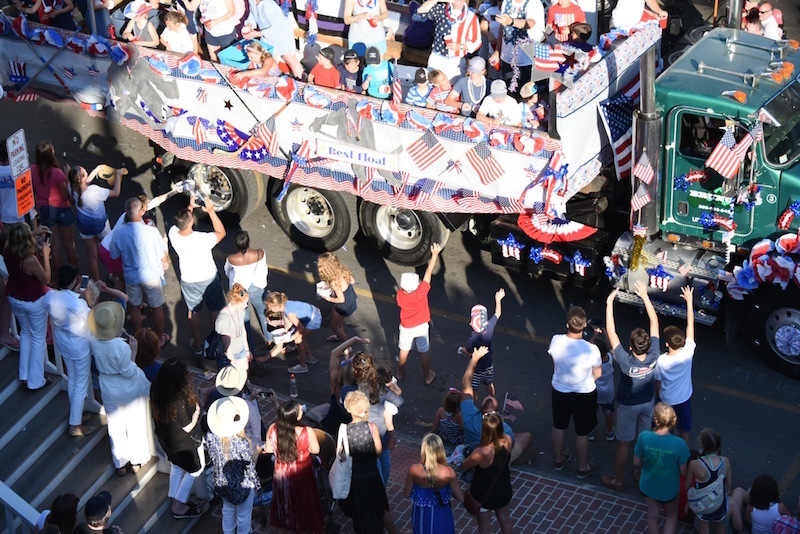 Crowds lined downtown streets Tuesday as floats made their way through Edgartown using a mix of bike power, horsepower and horse power for the annual Fourth of July parade. Feet were busy too, with bands, groups of veterans, the 1775 Colonial Navy from Fall River and others keeping pace alongside floats. Paws kept up; a brigade of golden retrievers, one wearing a sparkly red, white and blue top hat, represented the Animal Shelter of Martha’s Vineyard. Oversized animals of the inanimate variety took the helm on many floats. This year’s parade featured a pink squid, a pink whale, an elephant, and a rat, among others. Hours before the start, people staked out their spots along the parade route. John Suhler had been sitting across from Murdick’s Fudge on North Water street since 3:20 p.m. He has watched the parade with his extended family along the same half-block radius for the past 25 years. “You can get a lump in your throat and get teary-eyed, because it’s so special, and all of our children and grandchildren love it,” he said. Further down the sidewalk two men lay on the curb. With hats over their faces, they were impervious to passersby who stepped around them. Vendors aimed to profit from the crowds. Joe Capobianco helped sell lobster rolls at St. Elizabeth’s Church. “I’m set-up, clean-up and make-up,” Mr. Capobianco said. “We started with 120 pounds of lobster meat.” At 4:30 p.m., they had sold 400 of the 600 rolls. “It’s been pretty quiet today. It’s a good beach day,” he said. Next to their tent Marie Mercer and Sue Pagliccia sold boxes of Chilmark Chocolates, donated by the company to support an addition to Vineyard Haven’s St. Augustine Church. As the floats lined up at the Edgartown School, painted faces were already melting in the summer heat. 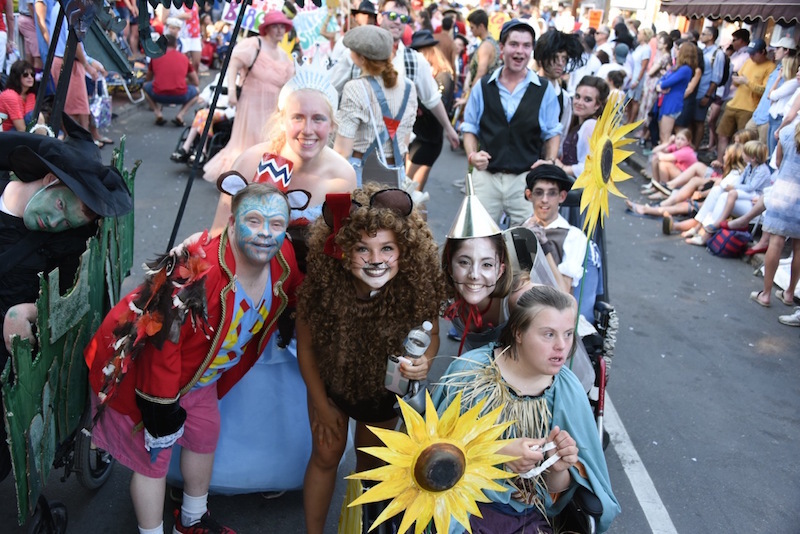 The Camp Jabberwocky float, an annual tradition in its own right, was Broadway-themed this year. Maggie Raemer designed the float. “We try to pick stuff that has enough variety that people can choose what they want to do, but also that we look like one cohesive group,” she said. The float was decked with replicas of iconic playbills from the Lion King, Wicked, Phantom of the Opera and Mamma Mia -- the play the camp is putting on this year. The camp also had a double recumbent bike with gazelles attached to the sides that moved as campers pedalled. Ms. Raemer said production on the float started two days ago. Despite the tight turnaround, “It always ends up being fine, that’s kind of our motto, it always works out.” Jabberwocky received the Special Award this year. The competition was judged by Edgartown selectmen Margaret Serpa, Arthur Smadbeck and Michael Donaroma. 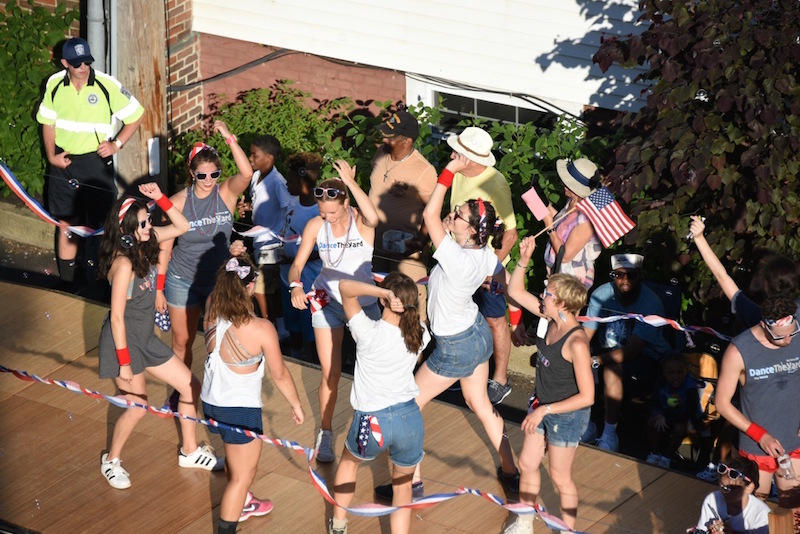 Martha’s Vineyard Little League won the Most Patriotic award for its float: a truck draped in bunting with American flags waving all around the edges, and red, silver and blue foil stars decorating the float that trailed behind. Felix Neck took the prize for Most Original float. The theme was Felix Neck Speaks up for Nature. A giant nest hung over the front corner of the truck; at the base of the float fish swam in a painted ocean. Aki Weiner, a camper who has marched with Felix Neck for four years running, proudly modeled his turtle hat— a painted turtle, to be exact — that he made himself. The award for Best Float went to Martha’s Vineyard Youth Hockey. Other sports teams were represented as well. The Martha’s Vineyard Regional High School’s state championship-winning girls tennis team rode in a truck outfitted with a racquet on its front grill. The girls threw tennis balls to their fans. Players walked behind the truck hitting the ball between each other as they marched. Fred B. 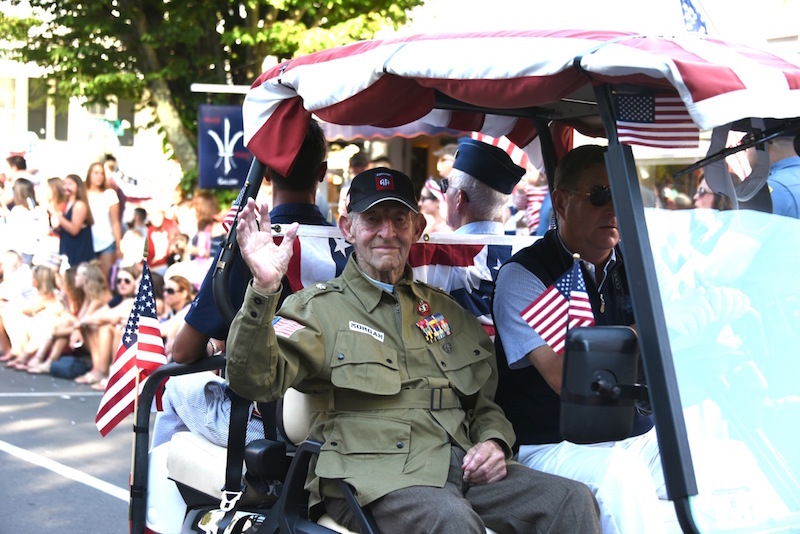 (Ted) Morgan Jr., a World War II veteran and former longtime grand marshal, led the parade with grand marshal Joseph E. Sollitto Jr. close behind. 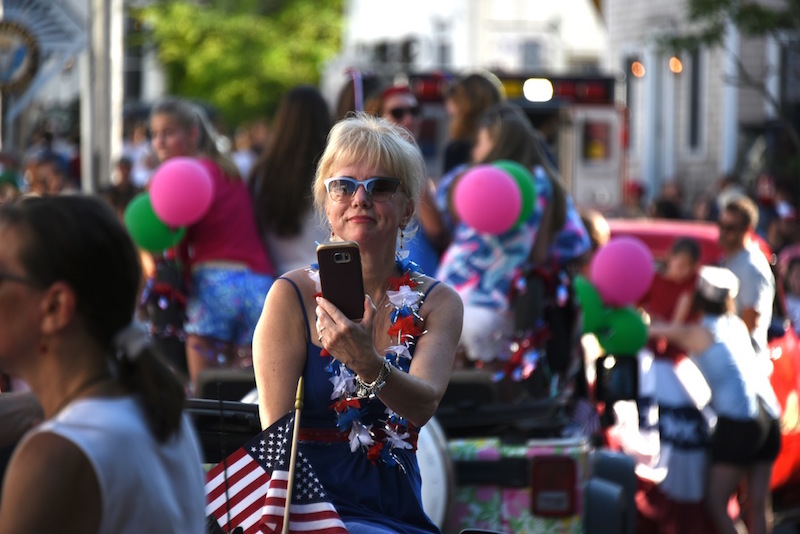 Spectators, dressed mostly in red, white and blue, spilled into the streets, watching and grabbing candy under a cloudless sky. A uniformed Coast Guard veteran commented on the summer heat as he marched: “I usually don’t perspire and I’m soaked,” he remarked. The heat led to two minor incidents along the route. The last of the Island fire engines had nearly pulled out of the school when an Aquinnah officer motioned for them to stop after a woman lost consciousness because of the heat, according to a state police officer. An officer yelled for the crowd to make way for a Tisbury ambulance on non-parade duty. The woman was given oxygen and attended to by EMTs. A few minutes later, the hot sun overwhelmed veteran David Kann, who was marching in the parade. Fellow veteran Michael Hewitt and others caught him as he fell. EMTs helped him while a woman passed him a bottle of water. “He said he didn’t feel well and then he started wobbling,” Mr. Hewitt said. The parade was halted as Mr. Kann was eased onto a stretcher. He was wheeled away to applause. 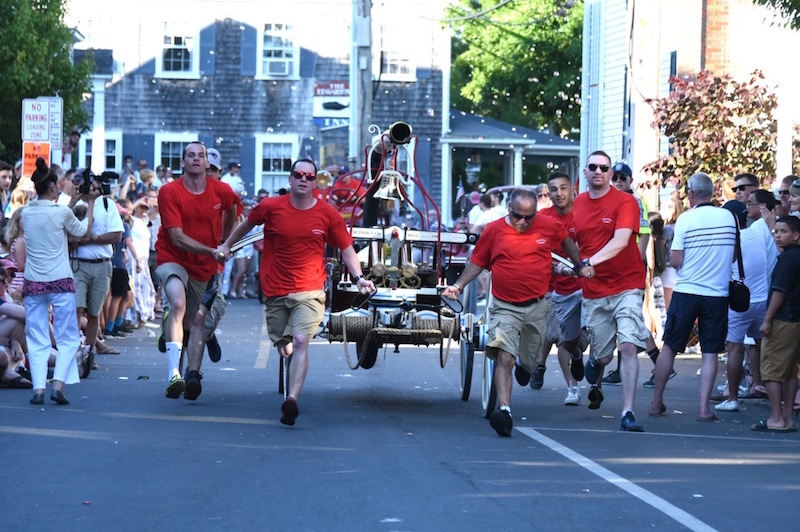 Elsewhere on the route, the parade progressed slowly through Edgartown streets. Sounded quirkily (is that a word?) delightful today. Wish I had been there. Vivian Ewing and Chloe Reichel: What an utterly delightful recount of an old fashioned 1950's type of day. The townspeople, organizations, veterans and onlookers seemed to jump from the Gazette's ink into the script from Disney's Pollyanna. The Veteran Ted Morgan's expression summed up the day. I wonder how often people wish that 'the old days' such as this, were here again to enjoy. Thank you for an adorable story. I'd love to join the crowd next year.